Aiden Morgan. Coningsby Reserves v Skegness Town A. photo: John Aron. Skegness Town A left Coningsby Reserves with a 3-1 success on Saturday. 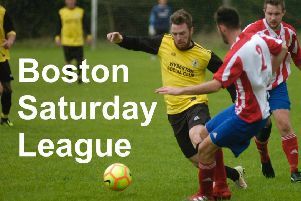 The two sides met in Boston Saturday League action. Dan Starkey. Coningsby Reserves v Skegness Town A. photo: John Aron. Josh Whittam. Coningsby Reserves v Skegness Town A. photo: John Aron. Morgan Coombes. Coningsby Reserves v Skegness Town A. photo: John Aron. Harry Ralph. Coningsby Reserves v Skegness Town A. photo: John Aron. Tom Flatter. Coningsby Reserves v Skegness Town A. photo: John Aron. Coningsby Reserves v Skegness Town A. photo: John Aron. Danny Cottingham. Coningsby Reserves v Skegness Town A. photo: John Aron.